Go big or go home seems to be Apple’s new motto when it came to the Apple event that it held this Wednesday. 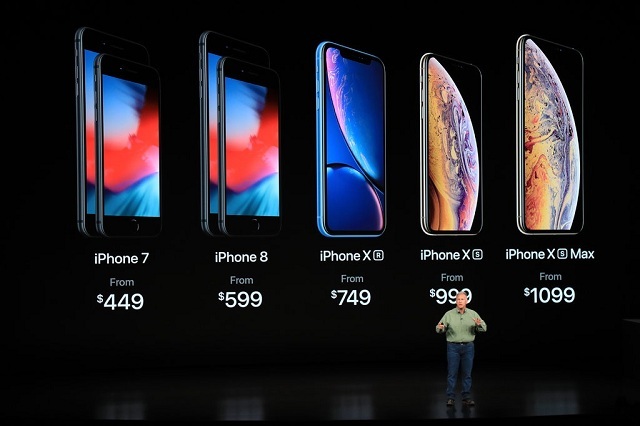 As Apple released its new iPhones, the overriding theme seemed to be that if you didn’t go big you had to go home as the starting price of these new unveilings are at $750, $1000 and $1,100, when last year it was at $700, $800 and $1,000. As iPhone markets saturate around the world, Apple plans on getting as much out of the market before it dwindles altogether by getting better performing phones and another alternative is to make a phone do more so that people wouldn’t have to look elsewhere for gaming and such. The new round of iPhones are supposedly bigger, better and faster than their last year’s counterparts. The biggest ever iPhone to be released at an Apple event was this time around. The new ever largest iPhone ever to be released by Apple is 6.5 inches and is called the iPhone XS max not extra small mind you but ten S.
This mammoth of an iPhone, as mentioned at the Apple event will retail for $1,100, if that does not make your eyes pop then I don’t know what will. Another mention at the Apple event was a larger Apple watch that comes with a heart trend monitoring system or ECG apparently approved by the FDA or Food and Drug Administration. The recent Apple event saw an iPhone XS which is a premium model that has a 5.8 inch screen and a 6.5 inch screen iPhone XS max model, which is its biggest ever selling smart phone. But if you’re looking for a more basic one then Apple also unveiled a 6.1 inch entry level iPhone XR model. The XS iPhone models will be the better, faster and bigger iPhones that was mentioned with better processing speeds and a super retina OLED display that has a wider color gamut. The iPhone XR model on the other hand will be made of aluminum instead of the higher end stainless steel and is made of LCD tech rather than the high-fi super retina OLED display. Although, the XR model is as fast as the XS models as said at the Apple event. Apple also released its watch series 4 at the Apple event which is much sleeker than what they released previously back in 2015. This time around, the watch series 4 as released at the Apple event has no bezel to go with it, making it seem as if it has a larger screen. This new watch as Apple said at the Apple event has better motion sensors to detect when a person has fallen down and has got major injury as well as a faster processor.